SAN FRANCISCO, Calif. – The U.S. Coast Guard is asking coastal residents and the maritime community to remain vigilant and to immediately notify authorities if they observe any suspicious vessels or activities along the coast, in port, or at sea. Over the past few years officials have seen a trend of smugglers from Mexico traveling farther north along the California coast taking longer routes and greater risks to evade patrols. The Coast Guard responded Monday to a report of a 24-foot vessel with no one aboard adrift in Carmel Bay. When Coast Guard crews arrived on scene it appeared that someone had attempted to scuttle the vessel by puncturing the hull with an ax. It is believed the boat may have been used for smuggling. “Fast 25- to 50-foot open-hull boats powered by two or more outboard motors, commonly referred to as ‘pangas,’ are used by smugglers to transport illegal drugs and people into the United States,” said Capt. Greg Stump, Coast Guard Sector San Francisco commander. 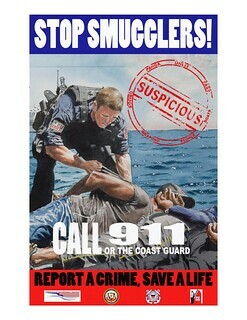 “Some folks may ask, ‘What’s the big deal?’ The big deal is that this smuggling activity helps fund violent international criminal organizations, threatens the safety of law abiding citizens at sea and ashore, and contributes to the supply of illegal drugs on our streets. We’re asking the public to help us stop smuggling by reporting any suspicious activity,” said Stump. The money earned from smuggling, and the illegal activities related to it, have been cited as a destabilizing influence in Mexico and causes tremendous harm to communities on both sides of the border. Illegal drug and human trafficking places federal, state, and local law enforcement officers as well as private citizens in danger. In December 2012 a Coast Guardsman was killed by suspected smugglers when they rammed a Coast Guard boat with their panga. In addition, the pangas often carry large amounts of fuel for their transit up the coast and once the smugglers complete their transit they abandoned the vessels leaving the remaining fuel to the mercy of the environment, needlessly exposing the community to dangerous health risks. The public is urged to report suspicious maritime activity by calling 911, or call the Department of Homeland Security Tip Line at 415-426-8815. All calls to the Tip Line are confidential. Tipsters can remain anonymous if they choose. Suspected panga found overturned near Pescadero, Calif.
04/15/2014 · Comments Off on Suspected panga found overturned near Pescadero, Calif.